When Hurricane Maria ripped through the Caribbean last September, the small town of Punta Santiago, Puerto Rico, was devastated. 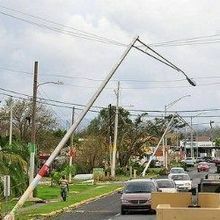 Many homes were destroyed, and people lost reliable access to electricity, clean water, and food. In addition to making sure their own families and neighbors had what they needed to get by, some of Punta Santiago’s residents had another pressing concern: the fate of 1,700 rhesus macaques living on an island a kilometer away. The monkeys inhabit Cayo Santiago, a 38-acre landmass off the east coast of Puerto Rico. The animals are the descendants of about 400 macaques brought to the island from India in 1938 by Clarence Carpenter, a primatologist then working with the School of Tropical Medicine in Puerto Rico. According to Richard Rawlins, a former director of the research site, Carpenter, seeing trouble ahead, established what came to be known as Isla de los monos (Monkey Island) as insurance against losing access in wartime to animals needed for vaccine development and other biomedical experiments. Caretakers who live in Punta Santiago provide the monkeys with food and water—there is no natural source of fresh water on the island apart from rain—but let the animals roam free. The primates have thrived and have served as a resource for generations of animal behaviorists, psychologists, primatologists, and researchers in a variety of other fields. 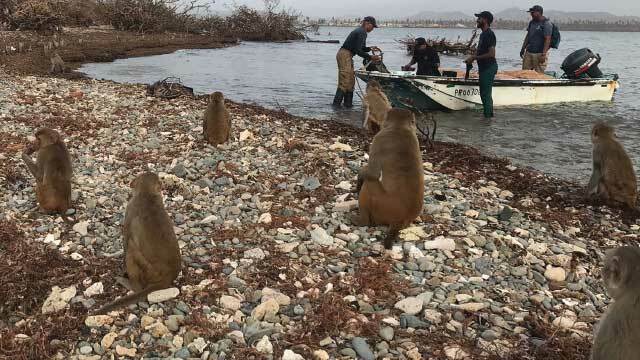 As they followed the news of Maria and its aftermath, researchers living outside Puerto Rico who had studied the island’s monkeys were deeply worried about the staff, the animals, and the residents of the town who’d hosted them. These scientists included Carol Berman, a behavioral ecologist at the University at Buffalo who’s studied the Cayo Santiago macaques since 1974. Cayo Santiago was Berman’s second choice as a research site. She’d been attracted to the study of natural behavior patterns in primates after reading a story about Jane Goodall as a teenager, but the famed researcher’s site in the Gombe Stream in Tanzania wasn’t taking new trainees when she reached graduate school. But Berman soon came to appreciate the Puerto Rican site’s unique advantages. Notably, all of the animals on the island have carefully documented histories and are habituated to humans. “It’s a great deal easier to study animals that are well-known” than most of those that are truly wild, she says. In contrast to captive monkeys, those on Cayo Santiago are free to form natural social groups. Over the years, Berman and her team have observed the animals to investigate questions such as how the monkeys’ parenting styles change as their tribes grow (Anim Behav, 53:405-21, 1997), and other ways in which family relationships influence their behavior (Am J Primatol, 78:63-77, 2016). 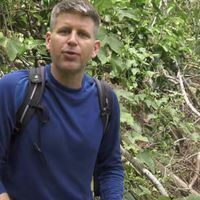 Laurie Santos, a cognitive psychologist at Yale University who’s been doing research on Cayo Santiago for 23 years, says she’s also gleaned useful scientific insight from the island’s resident monkeys. The macaques have enabled her team to answer questions such as whether the monkeys know that other animals have thoughts and can intuit what those might be. This ability, termed theory of mind, had previously only been seen in apes. Santos’s group suggested that rhesus macaques also possess this skill (Am J Primatol, 78:106-16, 2016). Days after Hurricane Maria ravaged the Caribbean, Angelina Ruiz-Lambides, associate director of the Cayo Santiago Biological Field Station, boarded a helicopter to assess the damage to the area. The hurricane had destroyed Monkey Island’s infrastructure and cut a gap through a narrow sand isthmus connecting its halves. The good news was that the macaques themselves seemed to have survived: all six of the island’s social groups were spotted, and Ruiz-Lambides and her census team didn’t find any dead monkeys on their initial walks around the island, she writes in an email to The Scientist. No humans live on Cayo Santiago—caretakers commute to work by boat each day. With docks destroyed or severed from the land by Maria, Ruiz-Lambides, who was seven months pregnant at the time, and other staff regularly waded into the ocean to climb into a boat for the trip. The team set to work restoring the island, rigging up new water collection and storage systems to replace the ones destroyed by the storm. In the days following Maria, Berman and more than a dozen other Cayo Santiago “alumni” tried to reach friends and colleagues on the island to check on their safety. 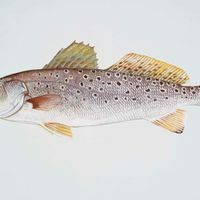 Some of the concerned researchers started organizing GoFundMe campaigns while others began planning a trip to help with cleanup and restoration. Forty people, including some alumni, took a volunteer trip to Punta Santiago and Cayo Santiago in late December and early January, according to one of the organizers, Steven Schapiro, a veterinary professor at MD Anderson Cancer Center. Although she is doing less fieldwork as her career advances, Santos says she still spends about two weeks a year at the site—2017 marked one of the few Thanksgivings she was not there. “At least for me, going as long as I have, it feels like home,” she tells The Scientist. 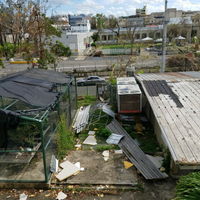 Rawlins has been struck by the actions of the Cayo Santiago staff, who have been caring for the animals, restoring the island, and organizing aid for other Punta Santiago residents, despite losing homes and resources themselves. “If you look at what they’ve done in the face of the total lack of government support . . . it’s really wonderful,” he says.